I just found an interesting short autobiography “THE LIFE STORY OF A GREEK PEDDLER – contributed by a Spartan now living in a suburb near New York City”. This story was published in 1906 as Chapter IV (pages 63-79) in a book titled “The Stories of undistinguished Americans as told by themselves”, which was developed from a series of articles previously published in theIndependent. This is made available to you through the Harvard University Library online. The person telling this story is unnamed. 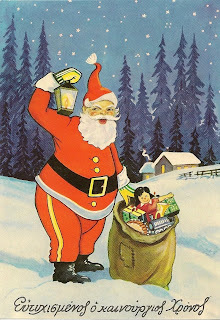 He was born about 1866 “in a little hamlet among the mountains of Laconia in Greece. There were only about 200 people in this place, and they lived in stone huts or cottages…..” He gives a description of homes, how they made butter, wine, ground wheat and oats, and made clothing, farming, no need for currency, schooling, saint’s days and other holiday traditions, politics, superstition, the trip to the United States, the push cart business, and more. I recently had the blogger at “Abravanel – Jewish life and not only in Greece” forward me this link to a list of 693 people born in Greece who died during deportation from France during World War II. 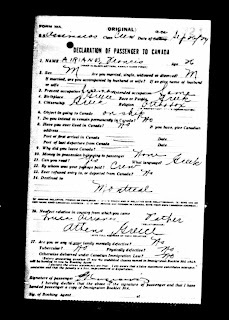 On November 25, 2009 Ancestry.ca completed the online launch of the Canadian Passenger Lists, 1919-1924. I visited Ancestry.com and did a search in this new database for people born in Greece -- 1,065 results were returned. As usual, there are some results that don’t seem to make sense, but most are Greek surnames. If you have ancestors that arrived in Canada during the 1919-1924 time frame, this may be a very helpful resource. Apparently this is the only online source for this data to-date. Remember that if you don’t want to purchase a membership to Ancestry.com, most libraries have an Ancestry.com version that you can use in the Library for FREE. - Also, Ancestry.ca is currently offering a 14 day free trial. Hi everyone. Here are nine (9) links to websites dealing with the Greek-Hungarian Diaspora. Here is today’s Greek recipe. Spinach with Rice (Spanakorizo)Ingredients:2 lbs. spinach1 cup chopped onions½ cup olive oil1-1/2 cups short grain rice2 tablespoons lemon juice1 tablespoon dill3 cups watersalt and pepperDirections:Wash spinach. Remove stems, drain leaves well and tear into pieces. (If I use baby spinach I don’t bother to try and remove stems, just use as is) In a deep pan gently fry onion in oil until soft. Stir in rice and cook 5 minutes. Add remaining ingredients (except spinach). Bring to a boil and then add spinach. Stir well, cover and cook gently for 15 minutes. (I always check to make sure rice is done – sometimes it takes a little longer to get done.) Remove from heat, leave tightly covered and allow to stand for 5 minutes before serving.Hope you enjoy it!Georgia Keilmanhttp://HellenicGenealogyGeek.comA resource for Greek family genealogy research.